It really is a great mod!! Now I can finally enjoy the Thaumcraft mod!! All the tiny words have been smoothly enlarged!! With this font, colon become invisible. With other fonts, everything is fine. In my environment, no problem was found with Blogger Sans (bold italic, etc). Colons are shown properly. I downloaded the font from "https://firstsiteguide.com/new-blogger-sans-font/" and used TrueType(*.ttf) font. Perhaps the font file is broken. 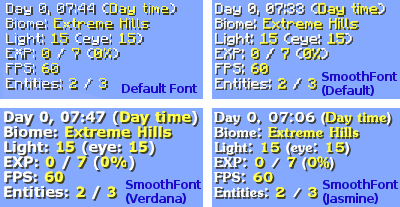 By the way, my environment is Win7x64 and mc1.12.2. For some reason, my font was broken and because of this the colon was not displayed. Reinstallation of the font solved the problem. I love your mod! I just got it installed and now I can't play the game without it! There is something I wonder though, in order to change any settings you have to either be on a server or in a world to press the button. It would be nice if I could open the settings in the menu or have a button in the configs to open it. Many mods allow to open a config screen by the following method from "Mods" button in a main menu before connecting to a world. Of course, Smooth Font can also. Press "Mods" button in a main menu. 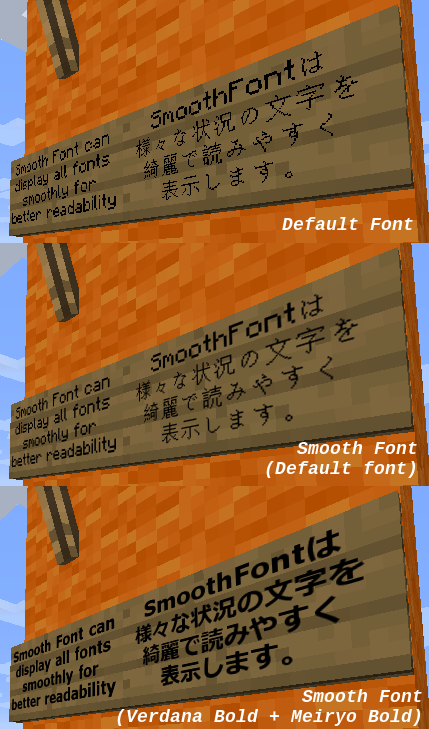 Is there a way to allow loading in of fonts located in the minecraft folder instead of from the system fonts? For example via Resource Loader? E.g. a font file in the /resources/ folder. 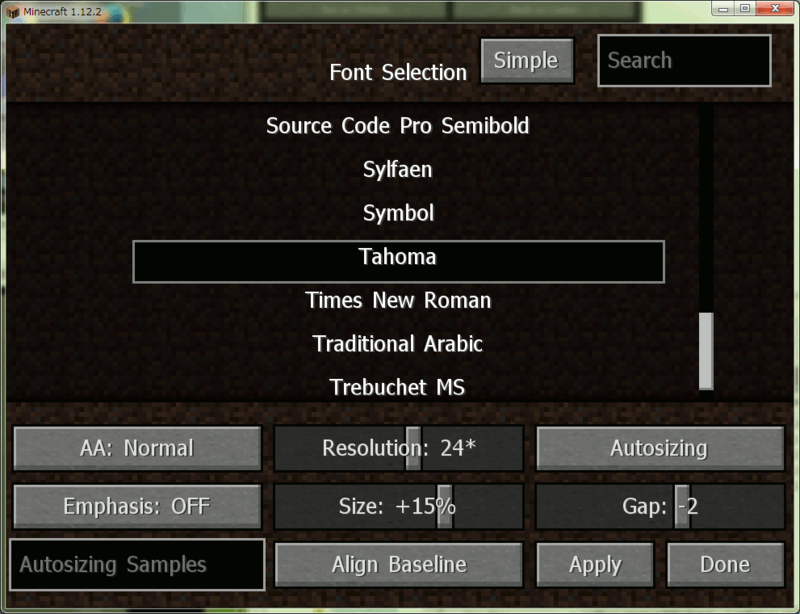 I would like to include a font with a modpack, and loading a font from somewhere other than the system folder would be needed for that, but I don't know how to go about it. 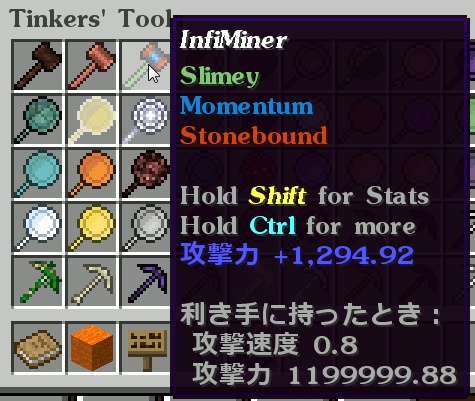 Currently such function is not implemented. I will investigate whether it is feasible. 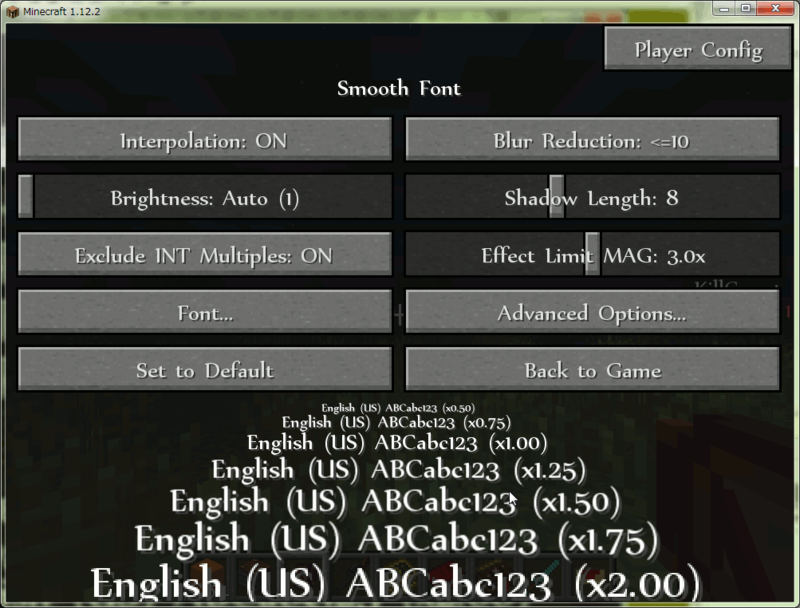 which isn't entirely clear if it's actually using a font from the /minecraft/fontfiles folder. Thanks so much for your test and opinion! 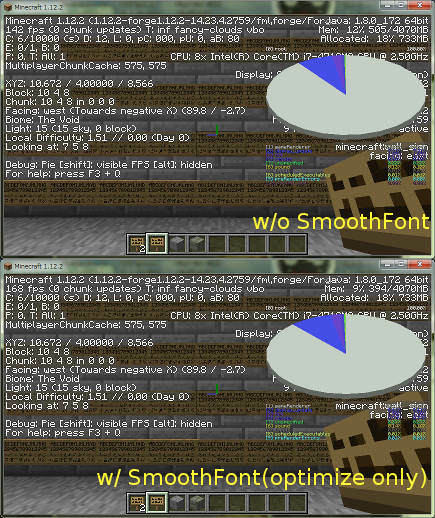 When there are same fonts in both /minecraft/fontfiles folder and the system, the font in the system will be used. Therefore, which font is actually used depends on the user's environment. So I will change the comment of the config so that there is no misunderstanding. Door Factory UI completely destroyed. Good if each third letter is rendered. Thanks for the report! The issue has been reproduced. 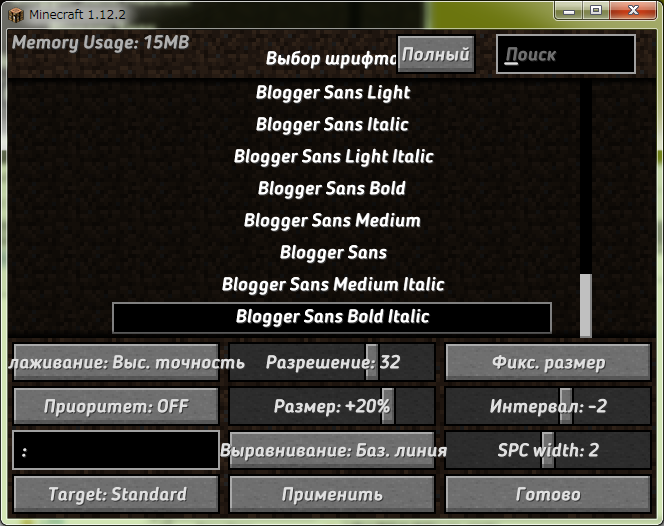 However, since that mod uses fairly special font renderer, it seems to be hard to consider how to deal with the problem. Anyway, I will consider a workaround. An alpha test version 1.15-a1 which has the workaround for Malisis Doors is available. The workaround is disabled by default because I don't know yet whether other mods are affected. Please set "workaroundKeepOriginalWidthValues" in the config to true. 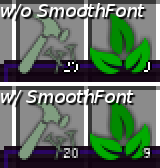 I have MCpatcher that changes the exp level color and it seems this mod overwritten that back to the vanilla green. Is there anyway to fix or workaround this? Unfortunately there is no such setting now. But I have a plan to add the setting to be able to disable the tweak of an exp level display originally, so I will add the setting in the next version.